At first sight, Deja Data looks like a program that can really enhance your browsing experience. Unfortunately, we do not recommend trusting it, because it has turned out that Deja Data is a typical advertising-supported application. It is very easy to distinguish adware because these programs show various commercial advertisements. They will appear on different websites, which means that your browsing session might be disrupted. We believe that it is very important to stop ads from appearing, because they might even expose your system to threats. In order to do that, you will have to delete Deja Data from your system. The application can be removed via Control Panel, so we assume that you will delete Deja Data very quickly. According to the specialists at pcthreat.com, Deja Data is going to show various in-text, interstitial, search-related, and even video ads on your screen. You should not click on them even if they seem normal because you might be taken to suspicious places on the web. Unfortunately, Deja Data will not only display ads, but will also collect information about your browsing habits. As can be seen, it is interested in non-personally identifiable data. If it happens that you do not want to reveal any information, you should delete Deja Data as soon as possible. Continue reading this article if you do not know how to do that. Adware programs published by SuperWeb LLC are unique in the sense that neither of them can be downloaded from their official websites. As the programs are still very prevalent, our security specialists believe that Deja Data travels bundled with other applications. 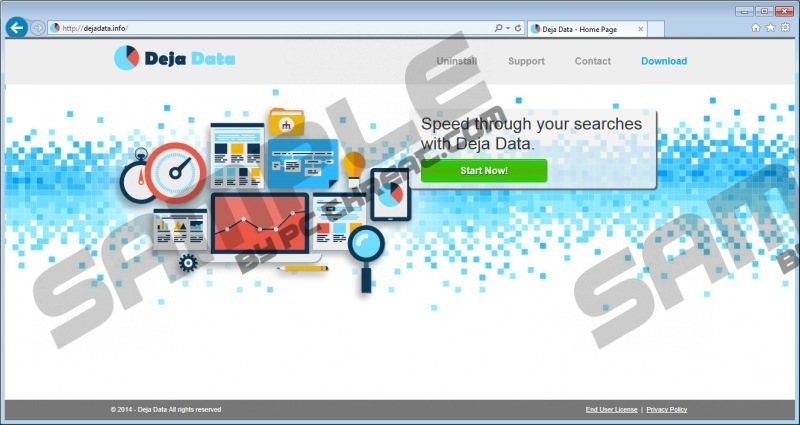 Not all the programs that come along with Deja Data are reliable; thus, you should check to be sure there are no unknown programs on your PC, then check them if you detect any, and, finally, remove them from your system together with Deja Data. We believe that you do not have any security tool installed on the system if Deja Data has managed to enter rather easily. Luckily, the program can be removed via Control Panel. Of course, you can remove it automatically as well. If you decide to remove Deja Data via Control Panel, you should still check the condition of your PC after the manual removal because other unreliable programs might still be present. In order to detect all the suspicious applications, you should perform a full system scan with the SpyHunter scanner. Select the program and then click Uninstall. Quick & tested solution for Deja Data removal.